Leonardo The Artist and The Man written by Serge Bramly, an extraordinary piece of writing, informative and extensive. 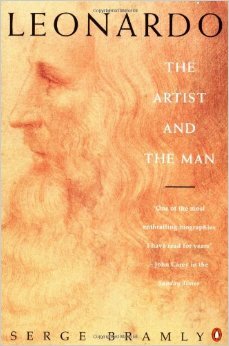 A great read for those interested in the detailed life of Leonardo Da Vinci and the processes of learning and expanding oneself through study and observation. Serge Bramly explores Leonardo’s personal notes, shedding light and unravelling this complex individuals life’s journey, as an artist, an eccentric genius, architect and engineer. Leonardo’s inquisitive mind was endlessly searching for perfection, always looking on how to improve on existing designs and inventing new machines to address the issues of the day. Join Leonardo on his successes, frustrations, failures, his explorations and inventions, a truly amazing and inspiring individual.